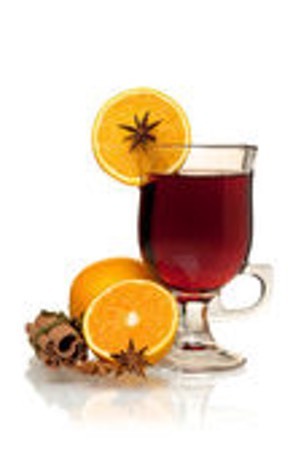 Here is another Telakan recipe, this one adapted from the recipe for glühwein. It makes two cups. Ingredients: Water, juice of one lemon or equivalent amount of orange juice*, 1 to two tablespoons sugar, 3 or 4 cloves, ½ teaspoon cinnamon, a dash of nutmeg, one 12 oz. bottle of beer. Squeeze the lemon or measure about ¼ cup orange juice into a small saucepan. Add an equal amount of water, the sugar, and the spices. Bring to a boil and simmer for about five minutes, till you have a thin syrup. In the meantime, open the beer and warm it gently. You can do this in a glass measuring cup in the microwave, or in another small pan. Don’t let it boil! Pour the warm beer into the syrup and stir. Cook it gently, without letting it boil, for about a minute, until it’s quite hot. It’s important to use a large enough saucepan – one that will hold at least 2 quarts, or 2 liters – because the beer will foam quite a lot. Share out the mulled ale and the foam between two mugs. Enjoy!